What services are available for students with disabilities under Section 504? Does the meaning of the phrase "qualified student with a disability" differ on the basis of a student's educational level, i.e., elementary and secondary versus postsecondary? Does the nature of services to which a student is entitled under Section 504 differ by educational level? Once a student is identified as eligible for services under Section 504, is that student always entitled to such services? How should a school district handle an outside independent evaluation? Do all data brought to a Student Study Team need to be considered and given equal weight? Once a student is identified as eligible for services under Section 504, is there an annual or triennial review requirement? How should a school district view a temporary impairment? What are the responsibilities of regular education teachers with respect to implementation of Section 504 plans? What are the consequences if the district fails to implement the plans? Yes. At the elementary and secondary educational level, a "qualified student with a disability" is a student with a disability who is: of an age at which students without disabilities are provided elementary and secondary educational services; of an age at which it is mandatory under state law to provide elementary and secondary educational services to students with disabilities; or a student to whom a state is required to provide a free appropriate public education under the Individuals with Disabilities Education Act (IDEA). At the postsecondary educational level, a qualified student with a disability is a student with a disability who meets the academic and technical standards requisite for admission or participation in the institution's educational program or activity. Yes, as long as the student remains eligible. The protections of Section 504 extend only to individuals who meet the regulatory definition of a person with a disability. If a recipient school district re-evaluates a student in accordance with the Section 504 regulatory provision at 34 C.F.R. 104.35 and determines that the student's mental or physical impairment no longer substantially limits his/her ability to learn or any other major life activity, the student is no longer eligible for services under Section 504. School districts must establish standards and procedures for initial evaluations and periodic re-evaluations of students who need or are believed to need special education and/or related services because of disability. The Section 504 regulatory provision at 34 C.F.R. 104.35(b) requires school districts to individually evaluate a student before classifying the student as having a disability. Tests used for this purpose must be selected and administered so as best to ensure that the test results accurately reflect the student's aptitude or achievement or other factor being measured rather than reflect the student's disability, except where those are the factors being measured. Section 504 also requires that tests and other evaluation materials include those tailored to evaluate the specific areas of educational need and not merely those designed to provide a single intelligence quotient. The tests and other evaluation materials must be validated for the specific purpose for which they are used and appropriately administered by trained personnel. 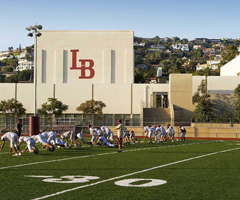 The LBUSD will consider the results of private assessments as well as a physician’s medical diagnosis. At the elementary and secondary education level, the amount of information required is determined by the multi-disciplinary committee gathered to evaluate the student. The committee should include persons knowledgeable about the student, the meaning of the evaluation data, and the placement options. The committee members must determine if they have enough information to make a knowledgeable decision as to whether or not the student has a disability. The Section 504 regulatory provision at 34 C.F.R. 104.35(c) requires that school districts draw from a variety of sources in the evaluation process so that the possibility of error is minimized. The information obtained from all such sources must be documented and all significant factors related to the student's learning process must be considered. These sources and factors may include aptitude and achievement tests, teacher recommendations, physical condition, social and cultural background, and adaptive behavior. No. A physician's medical diagnosis may be considered among other sources in evaluating a student with an impairment or believed to have an impairment which substantially limits a major life activity. Other sources to be considered, along with the medical diagnosis, include aptitude and achievement tests, teacher recommendations, physical condition, social and cultural background, and adaptive behavior. No. A medical diagnosis of an illness does not automatically mean a student can receive services under Section 504. The illness must cause a substantial limitation on the student's ability to learn or another major life activity. For example, a student who has a physical or mental impairment would not be considered a student in need of services under Section 504 if the impairment does not in any way limit the student's ability to learn or other major life activity, or only results in some minor limitation in that regard. The results of an outside independent evaluation may be one of many sources to consider. Multi-disciplinary team must draw from a variety of sources in the evaluation process so that the possibility of error is minimized. All significant factors related to the subject student's learning process must be considered. These sources and factors include aptitude and achievement tests, teacher recommendations, physical condition, social and cultural background, and adaptive behavior, among others. Information from all sources must be documented and considered by knowledgeable committee members. The weight of the information is determined by the team given the student's individual circumstances. The Section 504 regulatory provision at 34 C.F.R.104.35 (c) (3) requires that school districts ensure that the determination that a student is eligible for special education and/or related aids and services be made by a group of persons, including persons knowledgeable about the meaning of the evaluation data and knowledgeable about the placement options. If a parent disagrees with the determination, he or she may request a meeting with the District Compliance officer and/or request an Impartial Hearing. A temporary impairment does not constitute a disability for purposes of Section 504 unless its severity is such that it results in a substantial limitation of one or more major life activities for an extended period of time. The issue of whether a temporary impairment is substantial enough to be a disability must be resolved on a case-by-case basis, taking into consideration both the duration (or expected duration) of the impairment and the extent to which it actually limits a major life activity of the affected individual. In the Amendments Act, Congress clarified that an individual is not “regarded as” an individual with a disability if the impairment is transitory and minor. A transitory impairment is an impairment with an actual or expected duration of 6 months or less. Regular education teachers must implement the provisions of Section 504 plans when those plans govern the teachers' treatment of students for whom they are responsible. If the teachers fail to implement the plans, such failure can cause the school district to be in noncompliance with Section 504.